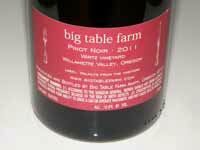 Big Table Farm was a featured winery at the 2013 International Pinot Noir Celebration. 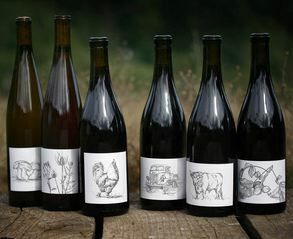 The name of the winery is apropos since Brian and Claire continue to raise animals on their farm including calves and steers, pigs, laying hens, and horses, as well as set a big table for guests who visit. 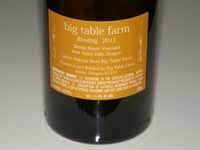 Big Table Farm is now leasing all 12 acres of the Wirtz Vineyard. 2012 will be the last vintage for Resonance Vineyard as that vineyard was purchased by Maison Louis Jadot who plan to use all the fruit for their own production. Kevin and Carla Chambers, who owned and farmed Resonance Vineyard, have acquired another property and are in the planning stages of planting a vineyard, so Big Table Farm should be able to work with them again in the future. Plans for a winery on the farm are complete. All vineyards in 2011 were picked at the very end of October and the sounds of trick or treaters filled the air as grapes were being sorted and processed. The wines are quite young and Brian recommends decanting if you open them now. 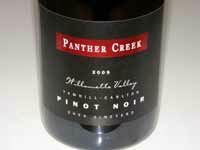 I found that all the Pinot Noirs were at least as good or better two days after opening. All wines are unfined and unfiltered. A big plus with these wines is that because the alcohol percentages are low, you can easily enjoy a couple glasses without getting sideways. Each label is a work of art by Claire. Visit www.bigtablefarm for more information or sign up for the mailing list. 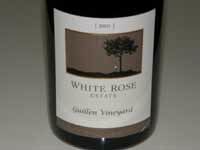 White Rose Estate Winery and Vineyard is producing some of the most interesting Pinot Noirs in Oregon. The wines are “neo-classical” as it states on the label, in that they are produced in the time-honored tradition of many great Burgundy wines using a significant amount of whole cluster that adds more secondary character to the wines and provides a fuller structure for a clear expression of flavor. Winemaker/owner Greg Sanders and winemaker Jesus Guillen or both self-taught, but they have a clear style in mind which has been fully implemented since the 2008 vintage. A number of tasters have likened the wines to those of Domaine Dujac, and I can’t argue with that. 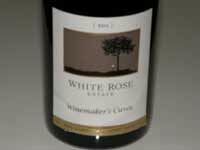 Some of the White Rose wines have been an epiphany for me. The White Rose Vineyard is 12 acres located in the southern part of the Dundee Hills at an elevation of 700 to 800 feet. The vines are self-rooted Pommard clone planted from 1978 to 1981 and Dijon 115 clone planted in 2001. The soil type is volcanic Jory series. In the 2011 vintage, all the wines reviewed below were fermented with whole cluster ranging from 75% to 100%. Total skin contact ranged from 22 to 26 days. All wines were basket pressed in a traditional wooden ratchet press and racked once after completion of malolactic fermentation. New oak ranged from 8% to 25%. All the wines display the enchanting whole cluster perfume, complex flavors, and a bold, yet silky smooth, tannin structure. Visit www.whiteroseestate.com.